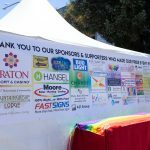 Sonoma County LGBTQI Pride - May 31 through June 2, 2019. Earn donations for your favorite local non-profit while giving back. Parade Contingent Registration is Now Open! Celebrate with us in the Parade! 2019 parade registration is ready reserve your spot today! Profile your business at the festival! Reserve your spot at the festival! Be A Part of Pride! Make a visible impact on Sonoma County's LGBT community! Planning a trip to Sonoma County to join us for Pride? Stay with our Pride partner hotels.